There are plenty of companies building smart hubs for your home, but it's safe to say that SmartThings, which was bought by Samsung, is one of the most popular. That's not only due to the wide range of connectivity options it has, like both ZigBee and Z-Wave, and the 10-hour backup battery life, but also thanks to the big number of smart home gadgets that are compatible with it. Even better, the community is very active and usually figures out a way, whenever technically possible, to add compatibility to brands and accessories that aren't supported officially. One of the last companies to integrate with SmartThings is Google and its Google Home speaker / voice control hub. Thanks to the latter, it looks like you'll be able to issue voice commands to toggle the lights, raise or lower the blinds, turn on appliances, and more. 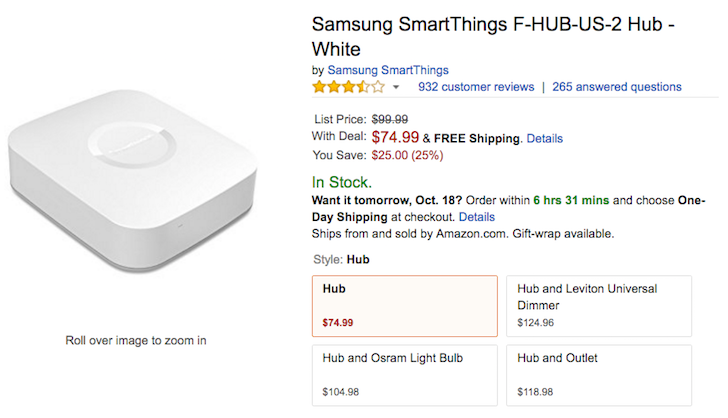 The SmartThings hub usually costs $99.99 on Amazon and the official site. Sometimes, it drops down to $79.99 for a day or two, but according to CamelCamelCamel, it's never been as low as $74.99. That's the price today, an equivalent of 25% off discount. If you're interested in getting a smart home setup started and you were looking for a deal to do it, this is a nice one, especially with Google Home on the horizon. Shipping is free with Amazon, so that's one less thing to worry about.